The Year of the Yellow Ox, "The Ox in the Byre"
Our esoteric astrologer and Chinese Astrology expert Malvin Artley looks at the meanings of the Chinese Year of the Ox in 2009. It will be a year of cautious conservatism, mixed with new methods aimed at defeating the economic downturn. It's time for a new start. The Chinese New Lunar Year begins on January 26, 2009, in association with the New Moon Eclipse in Aquarius, but the effects for all of us cover the whole of the twelve months ahead. Animal: Deer This is a good day for everything. This is a day for leisure. All else seems to go wrong. 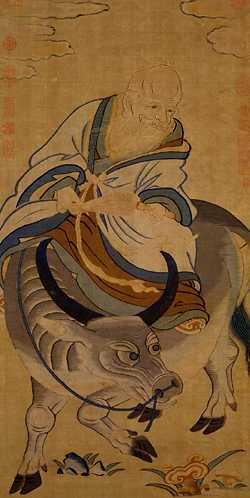 Opposition: Yang chi, driving all things forward, penetrates and supports them on their way. Yin chi opposes their progress. All things are of mistaken appearance. People seem to have favorites among animals, whether they keep those animals as pets, make them subjects of study (in a constructive sense) or just simply like to be around them and watch them. I could sit and watch animals all day, especially birds and small animals. We had chooks when I first came to Australia and I used to sit on the back stoop and watch them for the longest time. (I had never been around farm animals before.) If you just let animals be and watch them interact freely amongst one another one can see some of the most amazing or entertaining things – yes, even with chooks. One of my close relatives has such a fascination with cows. None of us in the family knows why. It has always been a puzzle to us. Perhaps she had a happy past-life around a farm or owned an ox as a beast of burden in that life. Maybe seeing cattle in a field invokes a memory of a peaceful pastoral setting and sends her into a sort of contemplative, serene state. Strains of The Pastoral Symphony waft through my mind with that image. Regardless, she has copped her share of ribbing about it over the years. Cows? Why? We couldn't figure it out. Kids can be bad that way. Maybe some day, if I remember, I will ask her what goes through her mind when she drives past a field with cattle in it. Farmer Owens paced slowly back and forth in the cow shed. It was in the wee hours of the morning and the humidity of the previous day still lingered in the air, almost like a hovering presence on the farm. Arthur Owens looked down on the prone form in the stall before him. Breathing heavily and occasionally groaning in the throes of her task, the weary ox was in a sad state. His ox 'Patches' had been in labor for the better part of the night and was having a difficult time calving. His young daughter had named the cow when it was still a calf and it was made clear to him early on that Patches was not to go the way of the other cattle of the farm. Patches was there to stay and was clearly his daughter's favorite pet. So, Farmer Owens had made Patches a draft ox and breeder for his stock. His daughter, worn out from the drama unfolding before her, was asleep on a hay bale just across from the stall. They were waiting for the vet to arrive to assist Patches with her bundle. Patches was past the point of caring what happened. She wanted to either deliver or die. The pain of labor had worn her out and she knew something was very wrong. Better to leave this world than to put up with this any longer, she thought. She knew her unborn calf was struggling with it all, too, and it would move inside her occasionally, only adding to her discomfort. The veterinarian finally arrived about a half-hour later, not very pleased at having to call in at 3:30 AM, and took a look at the sorry sight before him. “How long has she been like this, Arthur?” the vet queried. “About two hours now.” Farmer Owens replied. The vet surveyed the situation carefully. His gut sense was that he might have to end the suffering of the animal and try to save the calf if it was still viable. “No! !” The men turned in the direction of the shriek they had heard behind them just in time to see Arthur Owen's daughter leaping from the hay bale that had been her loft. The vet suddenly softened his attitude and bent down to the child standing defiantly before them. The little girl knew the vet was right. As the reality of the situation set in her lips began to quiver and she buried her face in her father's side, clinging to his leg. “It'll be OK, honey.” Farmer Owens said. “I'll look after Patches. You'd better go in the house now.” He called for his wife to take the young girl inside - just in case. The vet pulled on his long glove and went around to the rear of Patches to begin his work. And so, they got Patches on her feet and positioned her so the vet could inspect her from behind a wooden barrier, lest he should get kicked in the execution of his work. After a time and having a good feel of the calf, the vet announced that it was not as bad as he had thought. All he had to do was turn the calf and pull it out. As he began to turn the calf, Patches was not the least impressed and began to bellow her disapproval at this effrontery. Eventually, though, the vet prevailed and Patches gave birth to a healthy male calf, much to Patches' relief. Farmer Owens' wife and daughter arrived just in time to see the worn-out calf struggling to its feet. “Aww, Daddy! Isn't he beautiful? Can we keep him?” said Farmer Owens' daughter. “We'll see, honey. Let's let them rest for a few days first.” said Farmer Owens. Arthur Owens knew he had to be careful with this one. The last time Patches gave birth he eventually had to send the calf from that birth to the feed lots and his daughter wouldn't speak to him for a week afterward. He had to be careful that there is no conflict between family and business, though. One pet cow was all the family could afford. He would have to deal with his daughter later on that score. “You can untie her, now, Arthur. Patches should be fine. All is in its proper place.” the vet said. Patches was trying to lick her new-born calf in order to get it to its feet so it could feed, but she couldn't because she was tied. She was none-too-happy with Arthur Owens, either - or the vet for that matter. She did not want to lose another calf like she did the last one and she did not like the way the vet had just treated her. So, she waited while Farmer Owens untied her from the post. The very second she was freed Patches lunged at Arthur Owens, sending him flying for cover over some bags of feed, bellowing her sternest disapproval. Unable to reach Owens, she turned her attention on the hapless vet, chasing him out the door of the shed. No sooner had she got outside, however, that she remembered the beautiful little calf calling for her to come back. Maternal instincts aroused, she forgot the two men and returned to her charge. Arthur Owens' wife and daughter were hiding behind the hay bales, amazed at the complete and sudden change of direction in their beloved Patches. Motherhood prevailed, though, and soon all had returned to normal. Everyone came out of hiding. Arthur Owens sat on the feed sacks for a while and watched, wary of the usually placid ox. The vet surveyed the situation and realized that plans would be successful with mother and calf. Patches gave a few stern swishes of her tail as she licked the last bit of fluid from her calf and glared at the vet as he left, but she was very pleased to have her beautiful new calf now happily feeding at her udder. 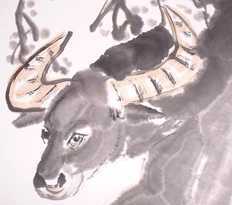 In part two of this article, Malvin examines the Chinese Year of the Ox in 2009. 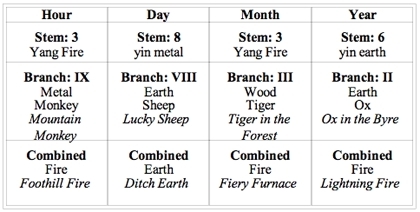 Malvin explains the astrological energies and outlines the nature of the Ox in Chinese Astrology, drawing out the examples of Ox years in the past, showing how they apply to this one. * The story here is based loosely on and adapted from the true story of Grady the Cow (which happened in 1949). 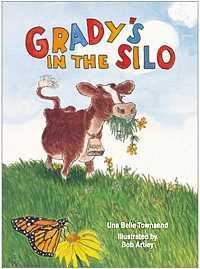 See: http://en.wikipedia.org/wiki/Grady_the_Cow and http://www.amazon.com/Gradys-Silo-Una-Belle-Townsend/dp/1589800982 For those readers who check out the second link, I did not know about Bob Artley until writing this letter and he is not a known relation, although he has done wonderful illustrations and books. Life really is stranger than fiction. Consider my little story as a tribute to Grady and fans of cows everywhere.